Matt Le Tissier – Honorary Member. We have a ground maintenance team who meet at the ground every Tuesday and Thursday – weather permitting. The team consists of several members including Tom Graham, Father Bob Dent, Young Bob Dent, Jock Hume and Ian Beattie. The aim is to carry out remedial/improvement tasks at Raydale Park. A ground survey was carried out earlier in the year and the report highlighted 28 tasks needing attention to enable the club to gain its Safety Certificate from Dumfries and Galloway Council. To date the team have carried out 19 of these tasks and the club has successfully received its Certificate. Some of the tasks are long term projects and hopefully these will be carried out when the weather improves. The ground maintenance team are always looking for more help and volunteers are encouraged to contact Tom Graham. SFA Club Licence Compliance Officer: Sandra Bowdon. In November, Alison Hampson successfully obtained our Health and Hygiene Certificate for catering from Dumfries and Galloway Council. We are always looking for more help and volunteers; so if you feel you could support the club please contact Jason Hampson. In 2016 we will be launching a Floodlight Appeal due to the ever increasing problems we are having and any help & ideas would be much appreciated. A Race Night was planned for early December but due to the adverse weather conditions in and around the region we had to cancel the event. A new date has been confirmed for the 30th January 2016.First Race at 7pm. The Bottle Draw will be held on the 30th January 2016 and draw ticket sheets are still available from Alison Hampson. We have a night with the ever popular Ashleigh Wood confirmed for the 20th February 2016 and tickets priced at £3 will be available soon. Various other events are in the early stages of confirmation and when confirmed we will be releasing the events and dates. A very good team performance from Gretna in a game that was very entertaining. Vinnie Parker pulled off some crucial saves at important stages in the game. Our goal scorers were – Anderson 3, Liddell and Danny Graham. 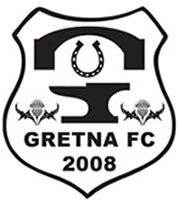 Gretna FC 2008 totally dominated the game and our possession of the ball with and without was excellent but unfortunately we couldn’t find the net and like everyone knows you only win games of football by scoring. We were caught cold by two set plays which was very disappointing and the reaction from the home side after the game was of disbelief “How did we win that game”. But as the score confirms they scored two and we could only score one and that is what wins you games of football. Our goal scorer was Connor Liddell. This game for long periods was dominated by the home team; it wasn't until they scored their third goal that we put together a good spell of football and pulled a goal back. In that period the home goalkeeper pulled off several tremendous saves. Stirling University are the best side that we have played away from home all season and are sure to be title contenders. In the final minute of the game Dean Crozier was sent off for a second bookable offence. The Gretna goal scorer was Connor Liddell. Gretna were missing several key players for this game due to work commitments and suspension – Parker, Casey, Atkinson, Reid, Jardine and Crozier. The home side were dominant for long periods of the game and deserved their win. The Gretna goal scorer was Iain Anderson. Injuries – We have Brandon Longcake out injured long term with knee problems. He has just had the results from his MRI Scan confirmed that he has Ligament and Cartilage damage that requires a consultation with an Orthopaedic Surgeon to confirm his next course of treatment for the injuries. Transfers – Scott Milligan has been transferred to St. Cuthbert Wanderers FC; we have thanked Scott for his contributions to the club and we wish him well. January 2nd: BSC Glasgow FC- Lowland League at 3pm. January 9th: Edinburgh University FC- Lowland League at 3pm. January 23rd: Gala Fairydean Rovers FC- East of Scotland Qual Cup Quarter Final at 3pm. January 30th: Selkirk FC- Lowland League at 3pm. We would like to wish all our Gretna FC 2008 Supporters Society members and club supporters a very Happy New Year. Thank you all for your valued and continued support.